PVC Bag with handle. Most of our Beach towels fit well into this convenient see through bag. Materials: PVC. Item Size: 28cm W x 43cm H. Colours: Clear PVC. PVC Cylinder bag with drawstring. 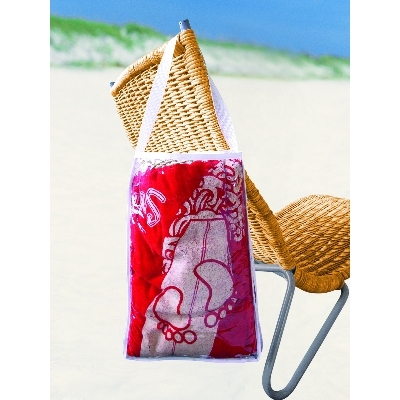 Most medium sized beach towels fit well into this clear PVC bag. Materials: PVC. Item Size: 38cm L x 12cm D. Colours: White. Features: The perfect addition to a travel set is this extremely functional basic toiletry bag. Featuring a zipper closure, side grab handle and front pocket, this hotel friendly accessory organizes all travel toiletries. Made with 70 denier nylon, this unisex bag is a perfect courtesy giveaway for guests at a hotel, convention, or trade show. The perfect piece to increase brand exposure while providing a versatile product to your end user. Features: Renwick Boutiquer Bag is perfect for any event and now is eco friendly Our Biodegradable Non Woven Bags are chemically treated during the manufacturing process to become *biodegradable in microbe rich municipal landfills. (*ASTMD5511)These bags have been created in response to the overwhelming plastic bag waste that ends up in Australian landfills. Scientists currently estimate untreated plastics will take hundreds if not thousands of years to breakdown in landfills.All our Bio Non Woven Bags have been independently tested in Australia under testing method ASTM D5511. Features: The lunch-bag styling makes this one of our best selling insulated cooler bags, and the Velcro seal makes it easy to open and close. Fully insulated main compartment with Velcro closing. FDA approved lining. Easy clean nylon. Open front pocket. Webbed carrying handle. Material: 70 Denier Nylon. Features: Hot/Cold foil lining; Open front pocket; Zipper top closure; Drop-in PE board insert. 2 handles: 64cm. Features: 80 GSM NONWOVEN POLYPROPYLENE LUNCH COOLER BAG WITH FOIL LINING. INCLUDES BLACK ACCENTS, SIDE MESH POCKET, STURDY TOP HANDLE, AND FULL-ZIPPER PULLS. Features: Two tone boat bag with front pocket and top snap closure, 280gsm cotton canvas. Natural with colored trim.